The first time we learnt about the magic of dim sum was in 2006 during our stay in San Francisco. Our friends took us to a place where we spent hours eating delicious food, surrounded by Asian families and above all Cantonese waiters pushing trolleys with little plates and bamboo baskets of delicacies. It was one of these culinary experiences that are hard to forget and one hopes to repeat sometimes. Three years later, in Hong Kong, the capital of dim sum, we got lucky! Dim sum literally translates as “little heart” and is a traditional way of starting the day. Nowadays dim sum is eaten throughout the day, always comes with tea and is best in big groups crowding around the round tables so you can share and try many dishes. Typical dim sum dishes are: any kind of steamed dumplings, buns with meat inside, rice with meat wrapped in a lotus leave, meatballs, turnip cake, rice noodle rolls, etc etc etc. Tim Ho Wan was recommended to us by our friend Emanuela who had read about the restaurant because of its Michelin star and its low prices in a Spanish online magazine. At first it took us a while to find the restaurant, but when we found a tiny place with a long queue in front, we knew we were at the right place. We got a number and started to wait. 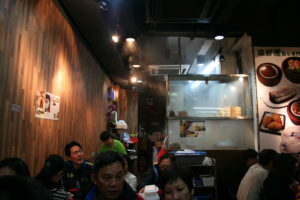 We grabbed a menu (only in Cantonese) and asked people for translations and favourite dishes. Everyone was very keen to help us out and raving about the place. Some people were studying their orders as if it was a difficult sudoko or some lottery (after several hours of wait, you wanna make sure you get the right food). Others seemed to live around the corner and eat here frequently. A camera crew from CNN pulled in. The reporter asked if Michelin was going to far by awarding this “whole in the wall” place with one of their coveted stars? After a three hour wait we finally got a seat and the feast began. Did we care that there were no fancy napkins, candle light, expensive wines and stiffly smiling waiters? Nope. The food was amazing, our new friends (from the three hour wait) were offering us some of their dishes, helping out with our next orders and were happily chatting away at the communal tables. This experience was definitively up to our San Francisco highlight and probably also worth a Michelin star. Son las 11 am y me ha entrado unas ganas de comer esas cositas!!! mmmmmm!! !